When technology incubator NextCorps (formerly High Tech Rochester) decided to relocate from the suburb of Henrietta, the natural fit was the spacious 6th floor of the former Sibley’s department store in downtown Rochester. At the center of Rochester’s ongoing revitalization, The Sibley Building’s transformation into Sibley Square — a 1 million-square-foot, mixed-use city hub, whose adaptive reuse is also spearheaded by TAT — offered a unique opportunity that mirrored NextCorps’ own vision of being a “catalyst for entrepreneurship and innovation-based economic development”. The extensive renovation included the historic preservation and transformation of the ornate former “Tea Room” into a modern co-working space and the outfitting of the adjoining former commercial kitchen area into a collection of private office suites, wet labs, support spaces, and common areas. The result is a vibrant and supportive space for incubator tenants to bring their ideas to fruition. 80 -100 total: 17 NextCorps employees and roughly 70-80 incubator tenants. Is there a mobile work or work from home policy? If so, what percent of employees are remote workers? As an incubator, the work policy is set by the tenants themselves. The NextCorps management team has a self-contained office suite with a mix of private offices and open plan. It’s a bit of a microcosm of the incubator itself. The incubator tenants have a variety of workspaces to choose from, depending on their needs and the size of their business. This ranges from open plan workspace, individual private offices, private office suites (small, medium and large) and private wet labs. Has the project achieved any special certifications (i.e. LEED, WELL, Living Building Challenge)? No, however emphasis on healthy finishes — including zero-VOC paints and vibrant, color-blocked flooring patterns, all CRI Green Label Plus or FloorScore-certified — contribute to wellness and sustainability goals. In addition, NextCorps brings inherent sustainability as adaptive reuse and historic preservation project. Taking advantage of the historic Sibley Building’s significant embodied energy, the project team’s approach was that the greenest building is the one already standing. The NextCorps management team was closely involved in the programming and design process through iterative room data sheets, concept imagery reviews, and online surveys. Detailed room data sheets itemizing sizes, quantities, and types of spaces and required adjacencies. Also used in documenting required equipment and utilities within a given space. Iterative process with the client involving rounds of feedback and revision to develop the final program. The design team prepared a presentation illustrating the 5 key challenges for the project and strategies for resolving these issues based on industry research and workplace design trends. The online survey of NextCorps employees to focused in on design aesthetic and functional requirements. Preliminary perspective views for visioning of amenity spaces & design elements. Co-locating Wet Lab spaces within a more traditional office layout required specialized plumbing, mechanical and electrical utilities and partitions with enhanced acoustics. Open Plan area (Tea Room) – historic preservation of former “Tea Room”. Creating zones of work, lounge and meeting within a space that allowed no new built elements. 3D image scanning of the former tea room was used to document and incorporate existing historic moldings and millwork. Showers and exterior bike racks to encourage cycling. The floor plate is quite deep which created zones that would receive very little or no natural light. The design team consciously located wet labs, the auditorium and support spaces in the interior. Communal work and amenity areas including the game space and community kitchen, conference rooms, and offices are arranged closer to the space’s periphery in order to foster interaction and maximize natural light and downtown views. What products or service solutions are making the biggest impact in your space. OrangeBox Airpods – TAT and the design team created acoustically private meeting rooms within the large co-working space where permanent construction was not possible. The mechanized louvered ceiling opens and closes to create acoustical privacy. The pods are fully accessible, feature whiteboards and monitors. All task seating throughout the project is manufactured by local fabricator Seating Inc. Custom-made conference tables by local furniture manufacturer Staach and a one-of-a-kind 55’ long wall mural by local artist Nate Hoge tap into the resources and talent of the local community. NextCorps was undergoing a complete rebranding, including their new name, in tandem with the construction of their space. Rather than the space reflecting the company’s branding- NextCorps took cues from the design to modernize and enhance their new brand with bold colors and crisp geometry. Their angular logo plays directly on the zig-zagging light fixtures used throughout the space. The new logo was incorporated into a custom graphic wallcovering behind reception featuring a variety of NextCorps’ mission statements overlayed in a tone-on-tone pop of vibrant blue. The co-working space is entirely unique. The historic mouldings and walk-through buffet (a relic of the room’s history as a restaurant during the department store’s hey-day) are offset by modern furnishings and dramatically geometric LED light fixtures. Crisp, museum-like white paint throughout is offset by the vibrant colors in the new carpet tile and furnishings. What kinds of technology products were used? (i.e. AV / collaboration / communication / wayfinding / space utilization)? The multi-purpose room is outfitted with (2) large monitors, audio system and video conferencing equipment. The room is dividable with an operable partition to allow multiple sessions. All conference rooms are outfitted with monitors and the café space features a large monitor which displays current events, news, and announcements. If the company relocated to a new space, what was the most difficult aspect of the change for the employees? Some employees were moving from a private office to an open office workstation. The design team offset this by including well-sized quiet rooms within the NextCorps management office suite itself and by ensuring that workstations were uniformly outfitted with storage solutions. The company hosted a grand opening event in which the new space and new brand were launched simultaneously. 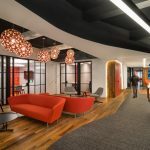 The design team’s overarching aim for NextCorps was to create a space that met all of the clients’ wishes for design aesthetic and functional requirements, and also went above and beyond those goals to inspire, nurture and delight – to support employee performance in a holistic way and encourage creativity, collaboration, innovation and engagement.